Creative Empire Podcast – Reina Pomeroy, the life + biz success coach, and Christina Scalera, the attorney for creatives host this problem solving podcast that resonates particularly with creative business owners. 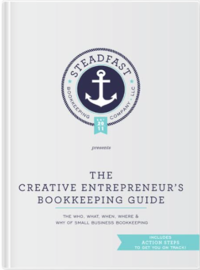 Christina is a client of Steadfast Bookkeeping, so we love the opportunity to get her perspective on success and how to reach it. After The Jump – This pod showcases creative up and comers in conversation with Grace Bonney of Design*Sponge. Bonney is a blog hero for many creatives and this podcast is the perfect companion to her colorful and creative posts. Bonney has also released a book, In The Company of Women, which features artists, makers, and entrepreneurs. While the show isn’t releasing new episodes, there’s 100 episodes for you to catch up on & enjoy whenever you like, which is really the beauty of podcasts. The Goal Digger Podcast – With episodes titled Creating Unforgettable Client Experiences, Following Your Intuition, and Mastering Productivity as an Entrepreneur, Jenna Kutcher’s podcast hits on all the topics that are on the top of our minds as small business owners. Here are a couple that we haven’t heard yet, but are dying to check out! Raise Your Hand Say Yes – This show describes itself as “one part storytelling, one part personal development, one part kick in the pants, this podcast showcases the creative adventures of (extra)ordinary people and teaches you how to have more of your own.” That just sounds so motivational and may be the perfect way to kick off a Monday morning! Do you listen to podcasts? For work, fun, or both?